Sometimes the weekly Magical Monday Moment is poignant (like When I Knew), sometimes it is a grand spectacle (like Jimmy Fallon's Glee-ful Emmy performance), and sometimes... it's just plain ol' magical. 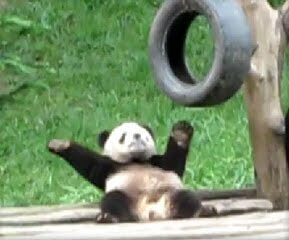 Fans of The Soup will remember this gem from a few weeks back - a video clip of a baby panda at the Bifengxia Panda Base in the Sichuan Province of China "dancing." Adorable. And thanks to YouTube searching efforts of PWYJ reader Christopher Smedick, we now have a glorious remix of that clip (and Magical Monday Moment). Maybe I shouldn't be so tickled by it, but I am - and I bet you will be, too. Enjoy!